It’s been a couple of weeks since I continued Kristen’s Ten Day You Challenge, so it’s time to get back on that bandwagon! Today’s prompt is Five Foods. At first, I thought I’d write about the five best foods I’ve ever eaten… and then I couldn’t think of five. That’s lame, because I’ve eaten a lot of tasty business, but I’m lazy tired, so we’re going with five foods I eat almost every day. This is probably the most exciting post I’ve ever written. 1. Baby spinach. I eat spinach at least once a day. I put it in smoothies, eat salads, mix it in pasta, whatever. It tastes good, goes with anything, and is super nutritious. I’m practically Popeye. 2. Cereal. I think I have an addiction. At least I usually stick to healthier varieties instead of sugar cereal (although sugar cereal is delicious). 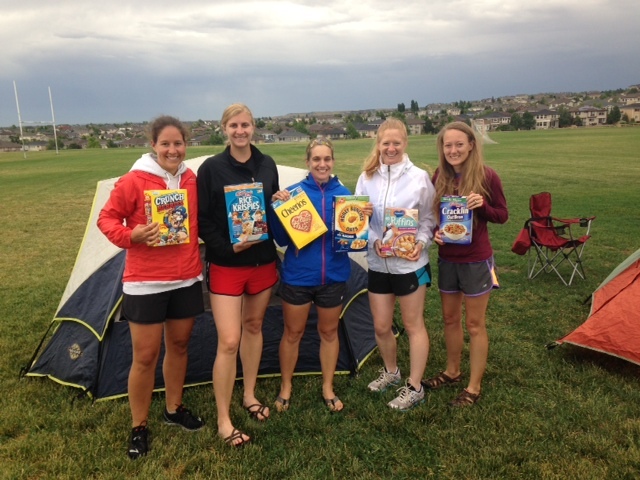 In honor of my cereal-fueled running, let’s flash back to Chase the Moon and Team Cereal Killers. 3. Peanut butter. My other addiction. I should seek treatment. Putting peanut butter IN my cereal is even better. 4. Bananas. Prerun. Postrun. In my cereal. In my smoothies. With peanut butter. Clearly, there’s never a bad time for bananas. 5. Almonds. Healthy, satisfying, delicious, portable: my four favorite qualities in a food. 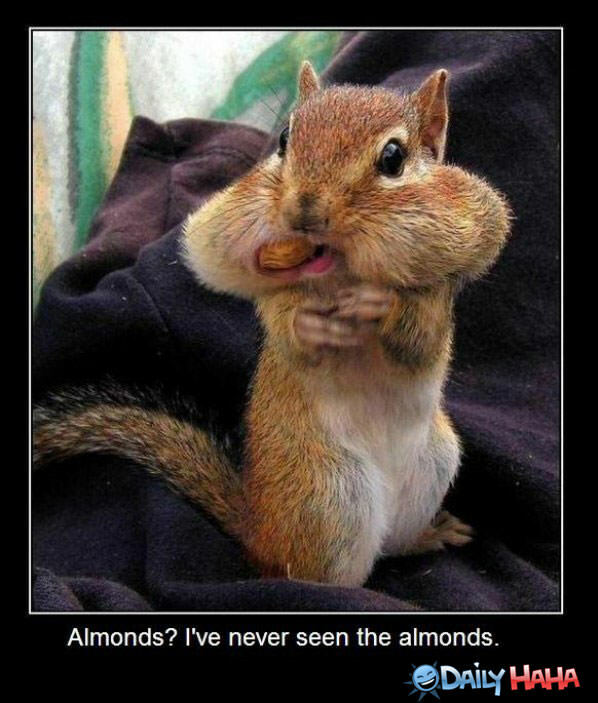 Almonds fit that bill! What your your five must-have foods? Yay Team Cereal Killers! I eat rice like mad, that’s normal, right? Chicken breast, quinoa, Special K protein plus cereal or shredded wheat, cheese, Oh, and unfortunately lately- chips! Do cherries grow in Montana? I LOVE cereal! I like to mix it up each week between healthy and sugary! I can’t eat chocolate cereal for breakfast though!! I seriously could live off of it! I almost never eat cereal for breakfast, actually. It’s snack/dessert food for me. It’s hard to only pick 5, but here goes… chicken, apples, bananas, peanut butter and I want to say salad, even if that’s more than one food! Salad can totally count as one food! Oh I am working very hard to get off the cereal addiction! I like Kellogs Just Right cereal YUM! I’ve been eating a lot of almonds, sweet potato, chicken breasts, yogurt, bananas and protein bars. I’ve never heard of that cereal! Now I’m gonna have to look into it… instead of trying to curb my addiction. I seriously cannot believe that you eat spinach every day. I probably eat it once a year. I’m very particular about how it is prepared. Are you a dry cereal type of girl, or do you always need milk added. I have a friend who is obsessed with eating cereal with no milk. I’m not even kind of picky about my spinach. I used to only eat it raw, but now I like it sauteed or in eggs, too. And I usually put milk in my cereal, but sometimes I’ll take it dry in a ziploc for a snack.